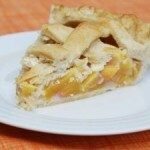 Mealy Pie Crust is an easy pie crust recipe that is a sturdier style crust. In the bowl of a food processor, pulse the sugar, salt and flour. Add the butter and oil, then pulse until the mixture resembles coarse crumbs. Drizzle in the milk and pulse until the dough starts to come together. Separate the dough into 2 even lumps, then gently squeeze each into a disc about 1 inch thick. Wrap each in plastic, then refrigerate for 30 minutes. When ready to make the pie, on a lightly floured surface roll one of the discs into a 13-inch circle. Always roll from the center of the disc and turn frequently to prevent sticking. Fold the dough in half, then again to form quarters. Lift the triangle of dough into your pie pan, putting the folded point in the center of the pan. Gently unfold the dough to cover the whole pan. You should have a generous overhang once the dough is all settled into the corners of the pan. If using a top crust, fill the bottom crust with your pie filling as directed, then repeat the rolling, folding and moving technique with the other disc of dough. Trim the overhang of dough to ½inch beyond the edge of the pan. Fold the edge of the dough under itself, pinching to seal. Using either a fork or your fingers, crimp the edge of the dough around the pie and against the top of the pie pan. 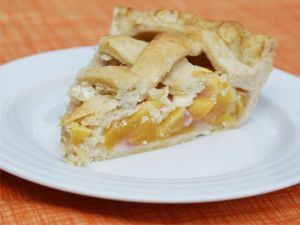 If using a single crust recipe, fill your pie after crimping the edges of the crust. Bake as directed for your pie recipe.